Mangaluru, Oct 29,2016 : State BJP President and former chief minister B S Yeddyurappa will be participating in the function to be organised by Kadri Cricketers at Kadri Maidan on October 30, at 6.30 pm as part of Deepavali celebrations. 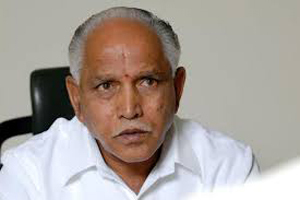 Retired army men and outstanding artistes will be felicitated on the occasion by Yeddyurappa. Manohar Shetty Kadri, President of Kadri Cricketers informed that ex-servicemen P P Joshi, Dinesh, Gopinath, Ramanatha Prabhu, film actress and TV anchor Anushree, talented singers Santosh Venki, Supriya Lohith, Nakul Abhayankar, Sarigamapa fame Sri Ram Kasar, Drama Junior winner Chitrali, Savita Kadri who participated in the Republic Day Parade, Chota Reporter Shreya Das, Tulu theatre and film artistes Devadas Kapikad, Naveen D Padil, Aravind Bolar and Bhojaraj Vamanjoor will be felicitated. There will also be a ballet highlighting the thoughts of Swami Vivekananda and Veera Savarkar by students of Sanatana Natyalaya. Several dignitaries including District in-charge Minister will be participating in the event. Manikanth Kadri and team will also present a musical orchestra. His arrival will make the city crowded and create traffic problem. Yeddurappa may be happy because he is even free from the cuty case too. Happy Deepavali to all .